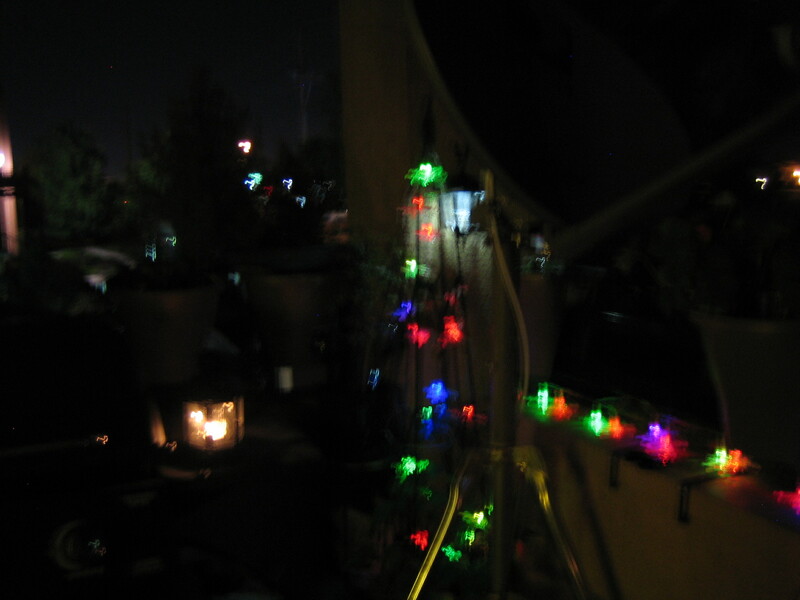 For my deck I wanted to sit inside at night and see the glow of lamps among my plants. In a larger space this would be pretty easy, but when limited in space it becomes a challenge. Much of the challenge is to not go over board, and to keep solar options in mind. Electricity is available on the deck, but it is not in a convenient place, and I question the safety of this particular outlet. 1 . Candles: I have 2 lanterns that look like old fashion carriage lamps. These I purchased at Ikea. They had 2 versions, one in white, and one in black. The last time I was there I also saw other candle lamp. The one thing I did not find is hooks to hang them from. Part of the struggle is I would like to use Shepard’s hooks place in a pot. 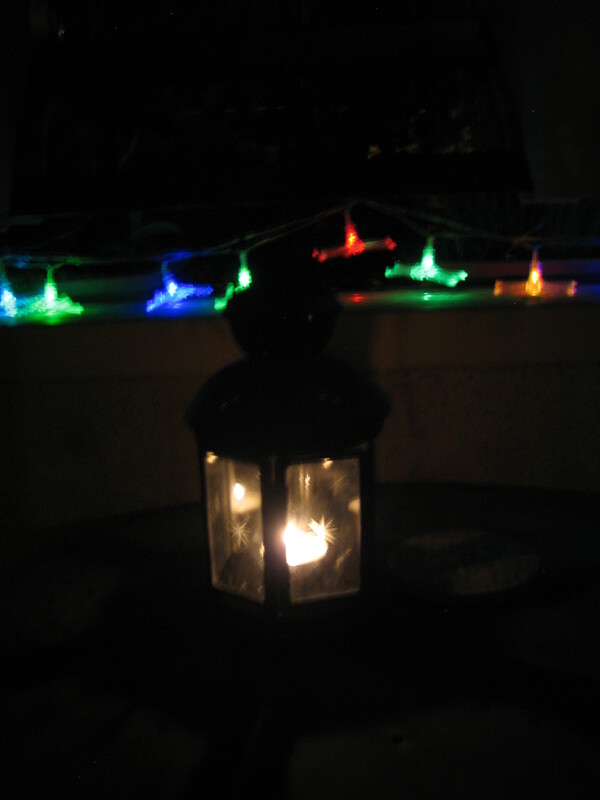 The candle lamps I use are either sitting on the small table, or I will put one next to the grill and one on the table. 2. Solar lamp: I have 2 solar lamps. These are the style you would get to line a walkway, or put around a patio. They came with small 2-3 foot tall Shepard’s hooks. I have used black zip ties to attach the hooks to the railing. It allows them to frame the front of the deck. I have a side railing as well, but it does not get as much direct sun. I have not gotten another 2 lamps to try here. 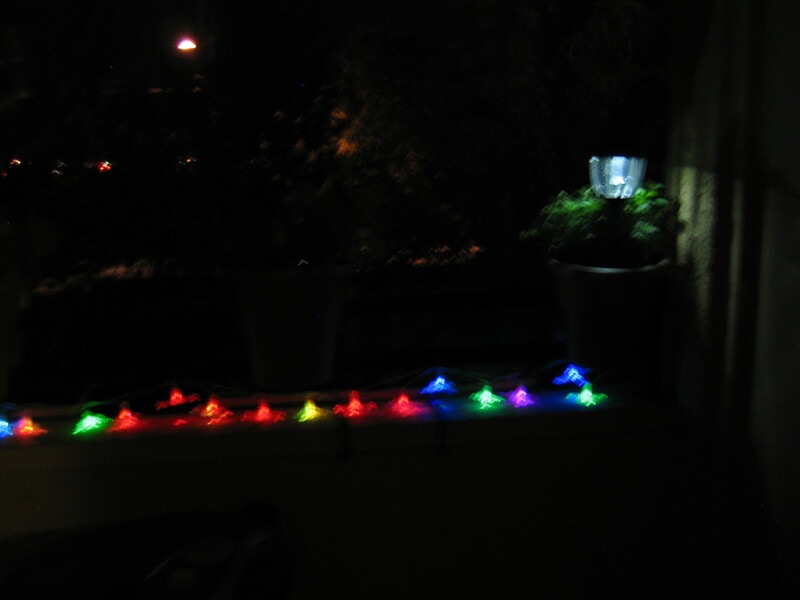 I do have 3 solar light stakes that I have along that railing, in the window box. They glow pretty good, but are a few years old and do not hold a charge very well. 3. 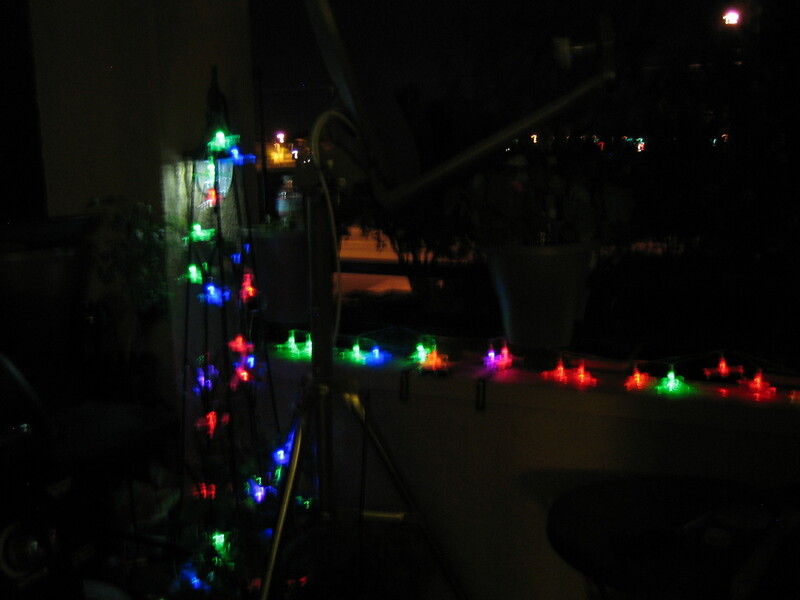 Solar string lights: I have 2 strings of lights. These are LED lights that slowly change colors. 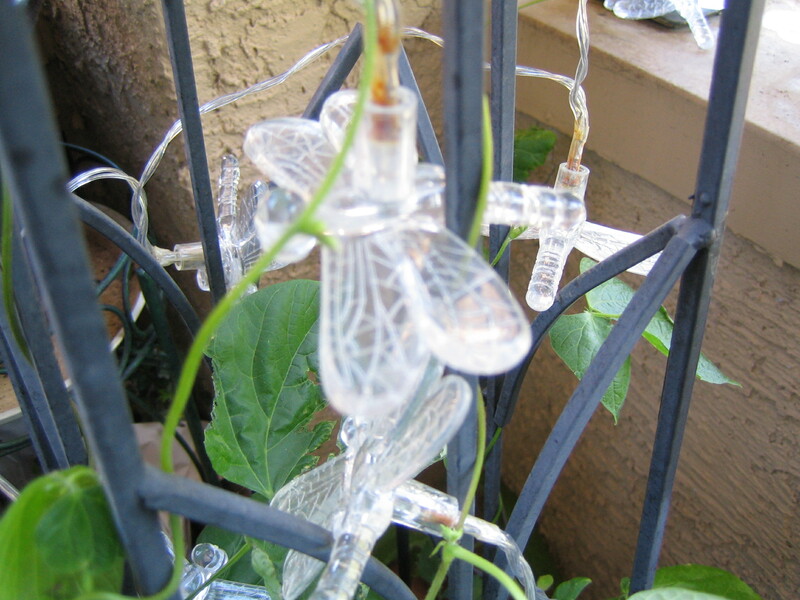 When I ordered them one was supposed to have butterfly lights, and the other dragonfly. They both came as dragonflies. The dragonfly is a plastic cover that slides on to the light. At the end of the light string is a solar panel. I have them staked into 2 separate window boxes that get the majority of the light during the day. At this time of year the lights are getting a full charge and coming on once it is full dark, and lasting into the early morning. I have one of the strings woven within the trellis. Now that the vines are starting to climb it has muted the lights a bit and made it more interesting in the dark. I have taken the other string and run it along the front railing. It is in such a location that it can not be seen well from the ground, but adds some color along the railing. I think I have gotten to the limit of the lights for the deck. Any more would defiantly be overboard. Especially if it included more string lights. I may be able to add a solar lamp or 2. I had at one time thought of putting a ‘mat’ up on the ceiling of the deck. The mat lights I am referring to are the ones you see at Christmas covering hedges. They usually are a square of evenly placed small white lights. I love the idea of putting it on the ceiling above the deck to add ‘stars’. I have not done so, because I don’t have one of those lights, and installing it could cause issues with the apartment complex. I am not sure how to do it without putting a hole in something. Lighting can add a lot to a space. When lighting a small deck or patio the idea is to make the space a continuation of the living space. To make the space inviting for a seat, and a glass of wine or a cup of coffee after dinner is my goal. And if the weather makes it not as desirable to be outside, I am trying to create the visual effect of the living room being bigger. Looks like you’re all set for a party. Great lights! Thank you. I have always loved lights twinkling in the dark in a garden. It makes the garden become light art in the dark. Thank you for visiting. So many forget about the garden at night and it can be a magical time in the garden. The color you added is lovely.